If you're in any way interested in beer, it's hard not to be excited by the times in which we live. While around 60 percent of sales within the "craft" market may be made up of pale and golden ales, there's so much else going on – particularly on the fringes. And particularly on the fringe where people are playing with yeasts and bacteria. It's probably the most risky area in which to experiment but one that is producing some fascinating results. 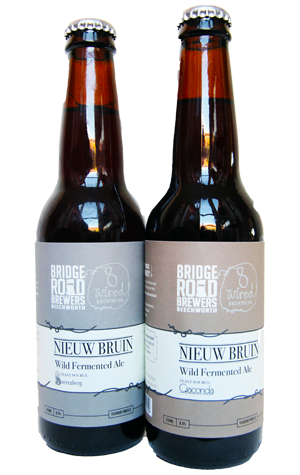 Among the most fascinating is this pair of beers released by Bridge Road. Last year, they joined forces with New Zealand's 8 Wired, a brewery that has been playing around with all manner of yeasts, bacteria and barrels for the past few years. They brewed a base beer – a rich, malty ale – then poured it into a pair of 500 litre Cognac barrels. Each barrel was then inoculated with wild Chardonnay yeast from two of the High Country's finest wineries, Sorrenberg and Giaconda, and left for 12 months to develop. According to Bridge Road founder Ben Kraus, the beers evolved considerably over the period, with his affections moving one way then the other. As they stand now, the Giaconda variant is the pick at Crafty Towers, offering up tart berry aromas and berry fruit flavours as well as a pleasing acidity alongside remnants of the base beer's malt sweetness and even a hint of roast too. Our tasting notes end, simply: "Lovely." As for the Sorrenberg, it's a far more complex bugger. Initial aromas float between cheesy and funky barnyard but also have a creamy "off" toffee thing going on. Some of the sharper acidity pokes through later on. Whichever way your affections end up swinging, if ever you needed to buy beers in a pair, this would be it.